Give the gift of soft hands with Mary Kay, The Body Shop and L'Occitane! Hand creams are a perfect gift, even for people you don't know or don't know what the hell to get them - everyone loves/need hand cream! Hostess gifts, secret santas, mothers-in-law or that annoying friend who swore you weren't going to exchange gifts this year and then gives you one anyhow (you know who you are) - have a couple of these wrapped up and on hand just in case and you look like the best gift-giver ever! I also like to stock up on these for myself, they are the perfect size for carrying around in your purse! Mary Kay Vanilla Berry and Vanilla Mint Hand Cream Duo - 88ml - $13 - give the gift of super-soft hands with a holiday-scented hand cream that provides instant moisturization. Perfect for purses and travel bags. Available until November 15th or while supplies last through your Mary Kay Independent Beauty Consultant - if you don't have one you can find one at - www.marykay.ca or 1-866-455-5454. 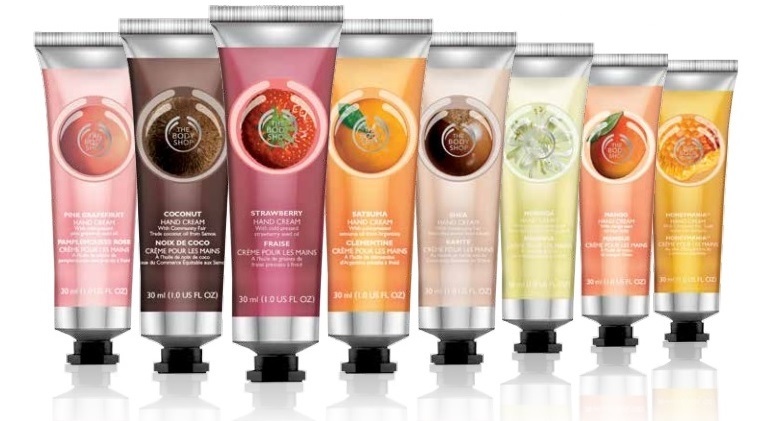 The Body Shop Hand Cream - 30ml - $10 - available in 8 scents: Strawberry, mango, Satsuma, Pink Grapefruit, Honeymania, Coconut, Shea and Moringa - that offer full-flavoured hand hydration with a lightweight gel-cream texture infused with Community Fair Trade shea butter from Ghana that absorbs instantly and doesn't leave your hands feeling greasy. Available now at The Body Shop and online at www.thebodyshop.ca. L'Occitane Hand Cream Bouquet - 30ml x 6 - $36 - includes all of your favourite shea hand creams in one pretty package: Shea Rose Hand Cream; Shea Lime Hand Cream; Shea Vanilla Hand Cream; Shea Hand Cream; Almond Delicious Hands; and Lavender Hand Cream - penetrates quickly to protect, nourish and moisturize your hands. Rapidly absorbed with no oily traces and doesn't need to be reapplied even after frequent hand washing. Available at L'Occitane boutiques across Canada and online at www.loccitane.ca.